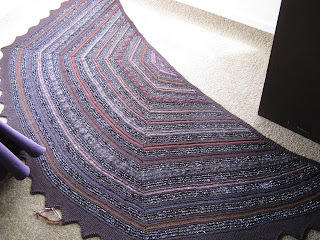 A place for a Kiwi, New Zealander to yarn about her knitting, family and life in general. But especially her knitting!!! Hi all, if I have any readers still checking in that is! I have had a very "unexpected journey" the past 3 years. I have been very fortunate in working for Peter Jackson in the costume department on "The Hobbit"
I cannot share the details as bound by contract but hope one day to be able to share some. It was a dream job, I mean sit and knit all day! and get paid for it! It was very challenging but I loved every minute. The hours were long which meant that the rest of life, including blogging had to take a back seat. Since finishing in costume I have now signed to do dressing on set. That is also long hours but very interesting. I think what has impressed me the most is the passion everyone shows for their job. Imagine working in a commune of artists all working on the same project. All with the same passion and a drive to give of their best. Peter seems to achieve this and draw the best out. I have the past few months been getting back to some sort of "normal". I have managed to get part time work at last which will help pay the bills while continuing with my Hand Knit design city and guilds studies. I am up to working on my first "piece" so full steam ahead. I have also been catching up on gardening , emails and housework. My other interest "jewellery making" has also taken on momentum. I produced 150+ pieces or sets of which I managed to sell 85 sets at the Hobbit Artisan market. So very successful. I have now got a possible contract to produce a range for a company selling to winerys in NZ. So busy working on that as well. I think that working as an artist is great but can be harder work than a "normal" 9-5 job! Anyway I hope to get back to more regular posting with pictures . Sorry for neglecting you! Wow has it been that long. I promise to get back to you one day. In the meantime I have a new job in the film industry which is eating up my time. Lots of fun and exciting to see from the inside the development of this project. I am working as a costume assistant which is all I can say, having signed an agreement to confidentiality with New Line cinemas. 10 + hour days up to 7 days a week doesn't leave much time for personal work. However that been said I did have a 5 week break when there was a pause in filming so am still managing to keep up with the City and Guilds work. Have nearly finished module 5 now. Speaking of which I am meant to be working on a Linen assignment so better go do it. Will get back to this again one day. So what have I been up too...!!?? 1. Gardening , the veggies are doing well altho the weather this year hasn't favoured the tomatoes , too hot and dry when the fruit was setting and then tropical storms to knock them off as they are ripening. We will have a bumper crop of corn soon and I have already frozen bags full of butter beans. The courgettes are doing their usual run amok and I have just tried making chutney with them tonight for the first time. Not sure how that will taste but if it passes the kiddy taste test may be a way of getting rid of [ I mean using up ] the surplus in the fridge. 2 Deck, we are currently extending the deck area off our lounge. The small one present when we moved in wasn't big enough to have a couple of chairs let alone a table. We are looking forward to enjoying this next year. As we get a sea view and we are planning to put up a shade sail if next year is as hot and humid we will at least keep cooler. 3. Kid minding. As DS2s job, kindy teacher aiding starts a full week to 10 days before the schools go back [ Not sure who dreamed that madness up! ] I helped out looking after the DGC then of course DS2 gets the tummy bug going around [ I am sure DS1 remembers the fall out from that episode 5 years ago! ] This meant more kiddy minding and meal making etc etc. Of course DGD has now started Brownies, and loving it but guess who is involved with that. I will have to watch it or I will end up a leader at this rate. 4. Exhibition #1 for the year meant working very hard on producing 25+ pieces of jewelery to enter. This opened 10 days ago and runs until this coming weekend. I am thrilled as I have sold 10 pieces so far!!! Here is a rather bad pic of some in progress. 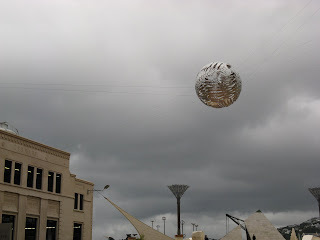 We had a quick trip to Auckland just before I had to have them finished [ in another storm , it poured!! ] So forgot to get a "finished pic" , will have to go and take some in the gallery this week. But 3 pieces went to some buyers from a cruise ship so are already by now on the other side of the world. I have been getting a lot of favourable comment re these. It has been many years since I did any metal work at college. I do enjoy it but it is a means to an end. If I can sell on average one piece a week I can afford to take off a day a fortnight to work on more important things such as C & G knitting. So I figure I am now owed 10 days off over 20 weeks!! 5. Knitting!! Yes there has been knitting. 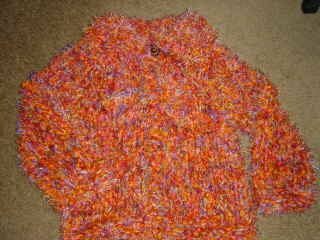 Mostly samples for C & G but I have finished my wrap using browns and cassette tapes knitted in a stripe pattern. This baby is big... just as I planned. 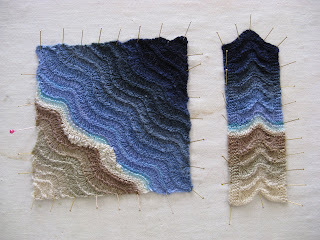 I am planning on making a fringe threaded through the border. As this is for an exhibition piece tied into a listening post of old music from the 60/70's the fringing will be long and I will attach cassette cases from the tapes. The idea is that in times of trouble and stress and grief we tend to turn to the familiar music from our past. So the wrap will be hung so you can stand in it and listen to the music. I am still working on including text on tape threaded through the holes from the lines on increasing. Have yet to write the poem for this... oh for another day a week! No promises but I will try and be a better blogger. Cheers and knit on !! Yes I am still here...! "God never puts any man in a space too small to grow in"
Some times I think I will just start using numbers, you know post 125 etc! As for space being too small sometimes it feels much too big.... "as in I have all this to do, what first?" I am so enjoying my design work.. and yes as per last post have made the last paymemt on my credit card so can hopefully in a week or so start having a day off every so often to catch up on art work. 1. Module 3 of City and Guilds hand knitting. I have done my edgings and am now working on bias and modular samples. I have looked out my yarns and pics for colour sources and can start tonight. 2. Have 3 exhibitions next year to work towards. Our Council gallery runs an exhibition for staff to enter so will, hopefully enter some jewellrey for this. I am been sourcing a piece of NZ Jade for a present and every shop I went into loved the items I was wearing.."Oh where did you get... etc" So really must make an effort to make some. These are some pieces I have cut and hammered. Sorry about the awful pic had a lot of trouble getting one with out the flash reflecting. 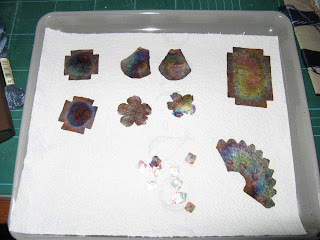 These are the same pieces once I have used the blow torch to put patina on them. DP has now put up a light for me over my work bench in the garage and I have a new bench top vise to hammer on. 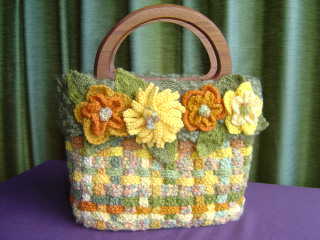 Just need to fold, stitch and add found objects and I will have 5 items to sell. I am also still working on my first piece for our exhibition in Sept, Oct next year. 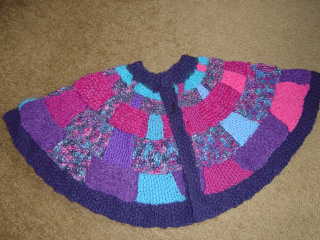 I am up to the edging and am busy designing the next to start. 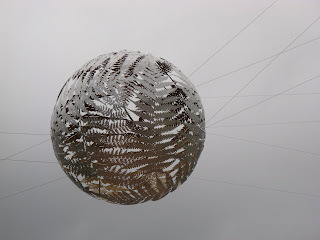 It will either be the copper wire cobweb or tin leaves. No pics yet, next time if you are lucky. The third exhibition is our National society one. 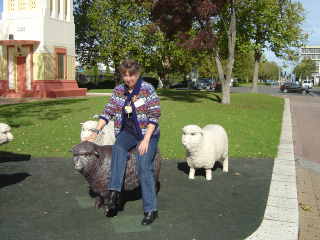 I normally enter every year and next years is in Timaru. 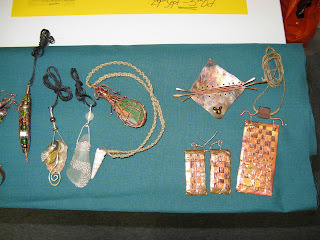 I may try and enter some copper jewelery as it is woven and stitched. Would certainly be easier than trying for any knitting with the time restraints I am under. 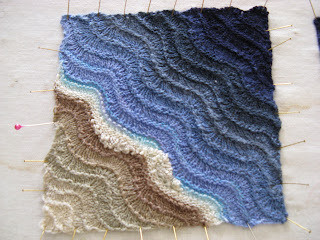 I want my box to contain "sea treasures" so made a piece to look like waves, ripples in the sea and sand. Thought it also came in with "chevron's and bias" knitting in my course. Not so happy with the colour as I wanted it to look sea like but the range of pearl cottons is only so big and it had to go with the dark blue linen I will be using to cover the box with. The "white" is silk and I have done some french knots to make it look a bit like the foam at the sea's edge. The narrow piece I am hoping to use on the book cover. We are going to make a book to go in the box. So hope I can use this. I have also looked out some shells to sew on the top and am working on some poetry to put in the book with some pics transferred to silk. 4. Gardening.... we have been enjoying a good crop of cauliflowers and cabbage and broccoli. But really must get it dug over to plant the summer veges. Just as well they are not in yet. We had a cold snap last week. I mean snow in November!!! At least it was fine yesterday for our general election. A good turn out even if I don't agree with the result! 3 years of National now at least..sigh hope they don't do as much damage as last time. 5. 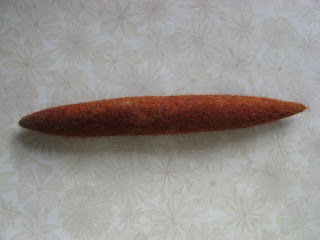 I have had the urge to try felting again. 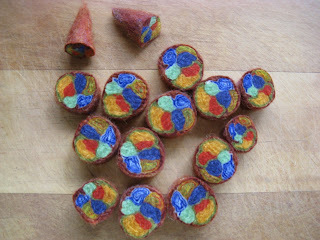 I am playing with needle felting on knitting and also making rolls of colour and then cutting them into flat beads.... a sample I tried....The "cigar" on the right once cut makes the beads on the left. I need to get some better colours to try. Thought I may incorporate them with the copper but the colours need to be better. This pic shows how rough it was. Believe it or not the main highway hugs this coast line you can just see the railway overhead wires in the distance around the point. The road is between the sea and railway. Stunning views. The last two pics today are just things I thought some one in the "ether" may find interesting. 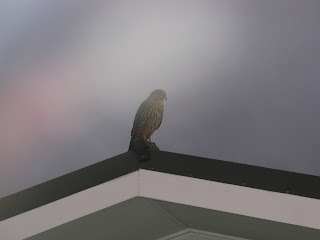 The first is a hawk I spotted out of our bedroom window. Excuse the awful pic... I sneaked the camera around past the curtain and the flash of course has "bounced" off the window. But when I tried to go out side to get a better shot he flew away. [ Of course it must have been a "he"!] It wasn't until the next day I realised why he was only feet from our window on the neighbours roof. Just below the peak on the roof the neighbour has a rabbit cage with a lovely white bunny... he must have thought free dinner! Thank goodness the cage is strong. This pic I couldn't believe.... 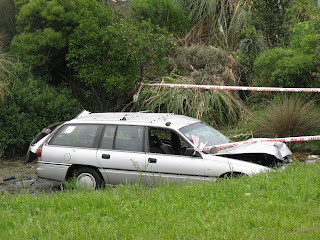 I mean to get here the driver must have hit a light pole, spun around hit another with the back of the car then down the bank and into the drink...the motorway is up the hill behind the bush in the back. The two light poles ended up in the lagoon as well. This was just down the road from home. Must have happen in the early morning... some one had a bad start to their workday. "Everyone thinks of changing humanity, no-one thinks of changing himself"
Yes I know it has been awhile since an update. Without excuse really other than being very busy at work which means been rather brain dead at night and too tired to be bothered. We have had a series of upgrades, as in email , phone, and programe upgrades with another library system upgrade due in November which has meant we have just finished a week of training. Most of the systems are much the same but acquisitions , which is now part of my job description is much more complicated and different. As in it took us a couple of hours just to figure out invoicing alone. So the past couple of weeks we have had eftpos, phone and cash receipting outages as well as library systems outages on top. So work has been "a pain"! Only words for it really. Also last weekend we had the dear grandchildren to stay for 3 nights. Their dad was involved as an exhibitor in an photography exhibition in Auckland. [ His first ] He was one of only four and it meant his traveling up to be there for the opening function. As this coincided with "his" weekend they needed a place to stay. They were very good , much easier now than when they were babies in nappies etc. There was much excitement when "dad" was on TV3 news on Friday night and his pictures were shown as well. We ended up going to the movies to see " Chihuahua" a movie about a dog that gets lost. Once you get over the fact that the dogs "talk" the movie was rather funny and we enjoyed it much more than we expected. They thought it was great of course! But joy of joys this weekend is a holiday , long weekend in New Zealand. Labour weekend to celebrate the start of the 40 hour week. The weather has been a throw back to winter with a cold wet southerly. But this has meant an excuse to stay inside and keep warm. Haven't done alot other than try to do some gardening before the rain drove me back inside. 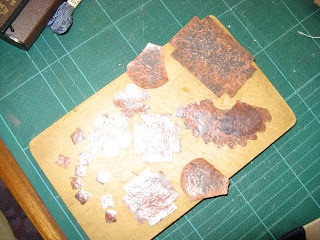 DP has put up another flourecent light above my work bench in the garage so have finally put my blow torch together and cut out several pieces from copper and annealed them. I did try hammering one piece but the cat went crazy so will have to do some more later. I have been slowly knitting a piece to mount in a box as I am doing another course in a couple of weeks and we need a piece of weaving or embroidery to mount in the lid. So decided to do a piece in pearl cottons. It has taken a couple of goes to get it right. Not too happy with the colours but it will "do". Other than that and slowly plugging away at edging samples for my city and guilds have been rather slack in the knitting department. I am in the middle of trying to arrange a trip to Washington DC next year some time. A friend is planning on going to the US open tennis champs [ in New York ] so we are hoping to travel together. 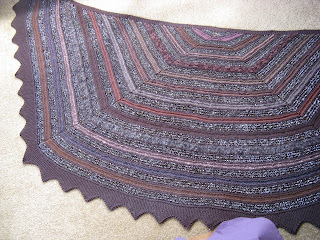 So perhaps can plan some side trips to Soar, or Stitches or Rhinebeck I will have to see. Anyway I have to think of our exhibition as well. I am in the process of making a big change. Just have "to feel the fear and do it anyway." I very much want to take some unpaid study leave to work on my art projects but as I support my grandchildren alot this has been something of a mission. I am fearful of "losing" money by not working but really want to work some more at home. So when my credit card is paid off [ next pay hopefully] am going to try a day off a fortnight and see how it goes. I have been told I can have "unpaid study leave" which means I can go back to full time if I need.... we ...will ...see... watch this space...! Anyway one thing we did do yesterday was go for a walk on the beach in the showers. 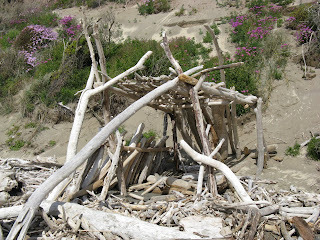 We decided to go to a different beach and it is more rugged and exposed. 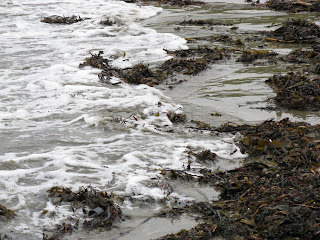 Lots of sea weed and floatsom. A very grey day. Knit on all, hope you are all having a great weekend. "Inspiration is just around the corner, the effort comes in taking the trouble to turn the corner and look for it!! How can I descibe the past 3 weeks, fantastic, mind stretching, inspirational, fast [ as in can I have a replay, a bit slower this time] or merely as W.O.W.!!! 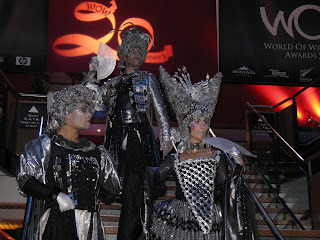 It started with being lucky enough to get tickets to the WOW awards dress rehearsal. This show is just mind blowing and if you ever get a chance don't miss it. I really enjoyed it and we had front row seats right where the models paused to turn so got a great view. This show is a real culture treat, the audience dresses up and they always have audience involvment and "happenings" outside as well. Of course I wasn't able to take any pictures but took a couple outside of the costumes of participants. Believe it or not but these three are "alive" and slowly moved through the crowd milling outside. This is the back view of another with an old wharf building behind. Next up was the junior school production staring DGS as a chicken and DGD as "Happy" the dwarf. The storyline was based on the 6 o'clock news and told the story of several fairy tales. Each class put on one story. It was very well written and the usual cuteness of small children . 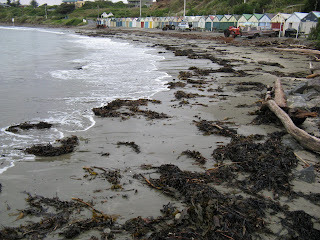 Then it was packing up and going to Aotearoa Textile fibre forum as mentioned in the last post. 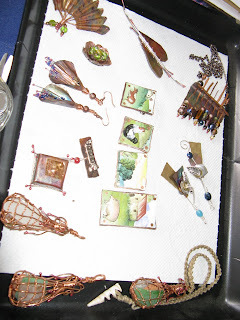 As usual this was a wonderful learning masterclass with an American tutor Mary Hettmansperger, a jeweller from Indiana. A lovely lady and an excellent teacher. I learnt so much and produced over 20 items. I had a wonderful time and have spent the past week, as well as catching up at work, and housework getting my work space freed up in the garage to set up my new blow torch. Thats right once the course was finished I brought some of the equipment cheap and am going to try and make some items to sell. I have received so many favourable comments if I can just sell a little I can take a day off a fortnight to concentrate on study. So have the equipment, most of it and the materials. Just watching on the metal punch to arrive from America. Couldn't buy it here , worst luck as the exchange rate with the world economic crisis at the moment is pitiful. So here are some pics of some items I made. I have slowly being finishing some off, still some to do and have been drawing up some designs to cut and burn and stitch. I have been doing knitting, just incase you thought I had forgotten my pointy sticks. I have been working through my sample knitting for city and guilds and am currently doing edgings. This time I am making a concentrated effort to make enough samples without going over board. I am trying tho to draw up some of my own designs rather than just using ones from books all the time. The week is a time of leaning, inspiration and a chance to meet with other artists from around the world and hear them talk about their work, lives and inspirations. We had Alexander from Russia, Glenis and Carolyne from Australia, Mary from USA and Pauline from the UK. So it has been a great weekend, The physio won't be pleased as I have "tweeked" my back moving stuff in the garage but much better to day so hopefully it will get better quick. Eek is that the time... better away to bed. 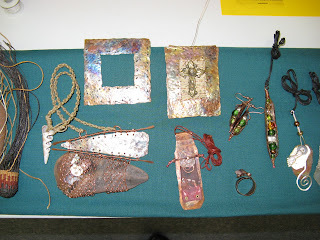 A quick post today as I am nearly ready to head off for a 7 day week of jewelry making with Mary Hettmansperger , a USA tutor at the Aotearoa textile fibre forum which starts this afternoon with a Maori welcome, dinner and a slide lecture. Classes start tomorrow and end on Saturday. There are lectures and dinners most nights then on Sunday a craft market where the artist attending can display and sell their arts. Anyway before I head off a catch up and a few random things, thanks Diantee! We enjoyed the two exhibitions the first being the Rita Angus one at our national Museum and art gallery Te Papa. Of course photos weren't allowed so check out the link. This was very interesting and have now got her book to read. I really enjoyed this day out or tho my partner found all the walking and standing hard work! 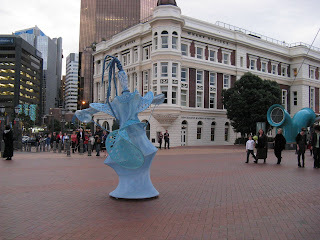 These two pics show the hanging scupture outside the city gallery. On the right day you don't notice the guy wires and it just appears to hanging in mid air. At night it is lit, great! 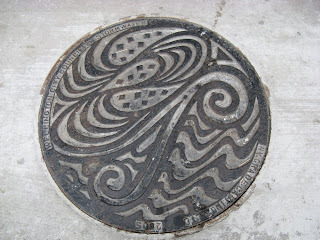 Of course on the way to the car found some man hole covers, thanks to Loraine I now look down and up as I walk around and many is the time I wish I had my camera. 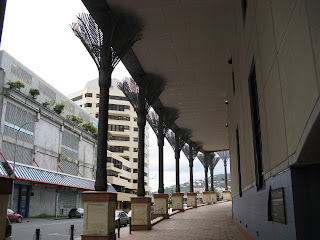 The next two pics are the "poles" along the side of the Wellington city council public library. 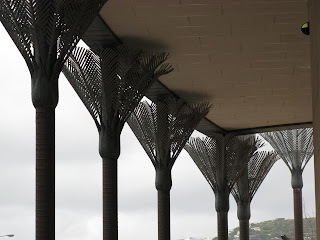 They are metal representations of Nikau palms. 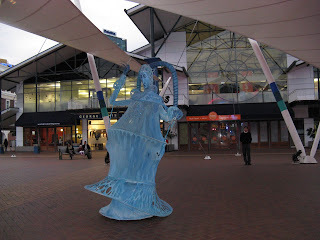 These are lit at night with blue light, another must see if you make it down this way. And last but not least saw this on the way to the car. 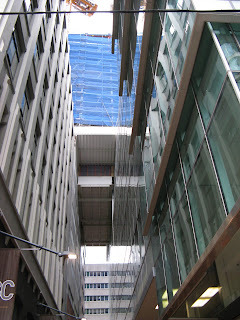 See the blue covered construction... well that is a building being built on top of a bridge between two other buildings!!! 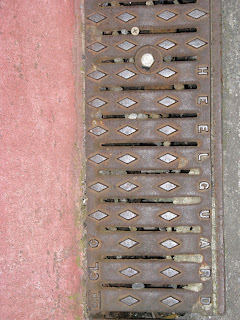 Not sure who approved this but I sure wouldn't want to be any where near this in an earthquake, and Wellington sits on top of several fault lines... and they say we are long overdue for a big one. I guess that random facts are more intesting if [a] I haven't mentioned them here before and [b] have nothing to do with knitting. 1. I was born in Wellington hospital and lived most of my early years in Upper Hutt where I attended Trentham primary and Upper Hutt College. 2. I married young, at 18 and moved to Australia for 6 months where I lived and worked in Brisbane. For a while I lived in New Farm. 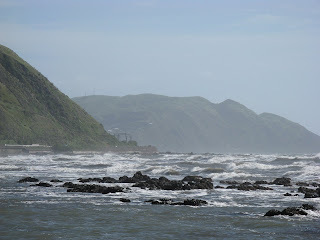 I also travelled as far north as Carins and Green Island and as far south as Melbourne. It was meant to be the start of a work around the world trip but as I got pregnant with son #1 we came back to NZ where I have lived ever since. By the way I worked a couple of months at the Golden Circle canning factory. 3. Hence at nearly 55 I already have a 35 year son. Who lives in Washington DC and I haven't seen for 4 long years. So I am planning a trip to the States some time. Next year if I can get the money and leave together. I figure it would be best to go when something else is on eg Rhinebeck or Stitches East. 5. I have very long hair as in down to my waist at this point in time. It used to be down to my hips but has been shorter for a while now. Reason why you wouldn't see the aides. I do tend to wear it up at work and with Wellingtons winds .....!!! This is my Grandmothers fault as she had long hair when younger and when as a child I saw the pics of her wanted long hair as well. I wasn't allowed until I could look after it myself as I wasn't very good about brushing. As a result once I turned 13 grew it and it has been long ever since. 6. 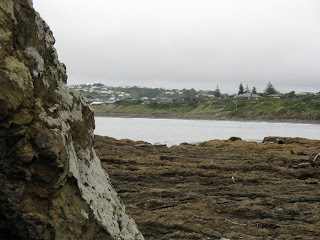 I am a second generation NZ on my mothers side as her parents arrived from Scotland in 1929 and on my fathers side they arrived from Scotland in 1852 on one of the first 3 settlers ships to arrive in Canterbury. My mothers great greats supported Bonnie Prince Charles and fled to France with him so have some french in the mix as well. As a result one of my must visit countries is Scotland and would love to go to the Shetland islands as I have been a passionate lace knitter in the past. Anyway enough about me it is now your turn. 2 Post the rules on your own blog. 3 Write 6 random things about yourself. 4 Tag 6 people at the end of your post. 5 Let each person know they have been tagged. 6 Let your tagger know via comment to their post you have passed it on. So without futher ado these 6 have been tagged, hope you don't mind too much!! Ok this will have to do for now most of my links are at work and I need to leave will have to link some more later. This is a Flickr badge showing public photos and videos from yarnz4knitters@xtra.co.nz. Make your own badge here.